Have I said before that I’m thrilled that macrame is back in style? I am, I’m totally thrilled! I’ve been working on a macrame table runner, but because I’ve had too many projects going at once, it took awhile for me to finish it. Now that it is finished, I love it! And also, now that I’ve finished it, I can easily say that I will never, ever, ever make a big project like this out of yarn! The knots tied tight and small and this runner took several times the amount of time that the same table runner would have taken with different cord. It wouldn’t have required that I tie so maannnyyyy knots! The entire runner is made with only one knot, the square knot, tied in alternating square knots and square knot sinnets. First I determined how long I wanted the runner to be, which was 60 inches. Using 4 cords, tie a knot about 5 inches from the end. Repeat this 9 more times (all cords should be knotted). Pin the cords at the knot to the cutting board in a straight line. 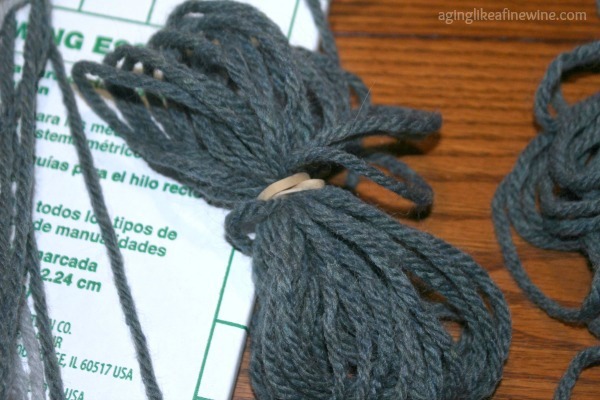 Always wrap up the long cords on your macrame and secure with a rubber band or a hair band. Now my directions are going to seem very vague because I’m not going to provide the number of rows of each of these because this would vary depending on what type of yarn or cord you use. 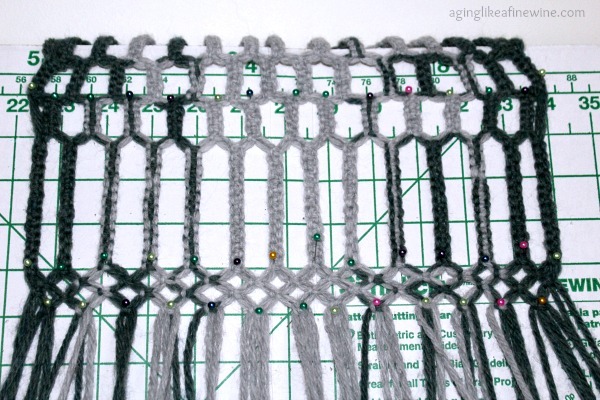 I determined the pattern I was going to use for the table runner and then how many inches I would need to do of each different pattern. I had lots of yarn left over, so if I ever do decide to macrame something with yarn again, I’ll remember that and not cut it so long. I realize I haven’t provided very good directions to duplicate this runner, and I apologize. The great thing is you can determine your own pattern and just go with it! 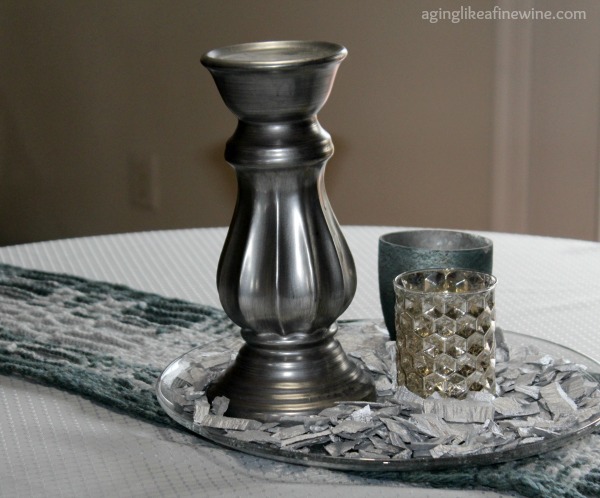 My vision for this table runner had been to place it over a gray tablecloth on my dining room table. And it is very pretty there, but I experimented some by placing it over the dark wood on my sofa table and I like that very much too. 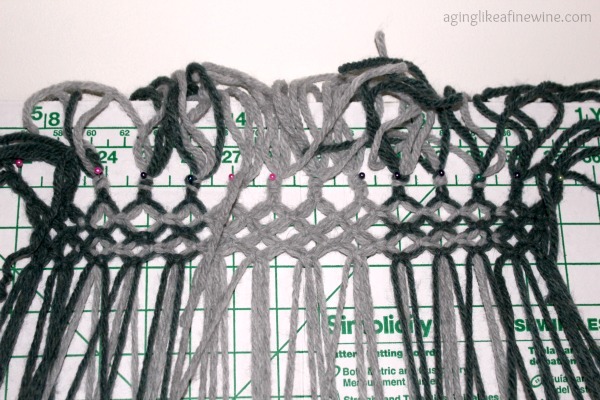 If you’ve never done macrame, or maybe it’s been many years, give it a try. It’s easy to learn and fun to do. If you have any questions that I might be able to answer, please feel free to ask them in the comments. P.S. This post will be shared on many of the link parties found on my “Where I Party” page. 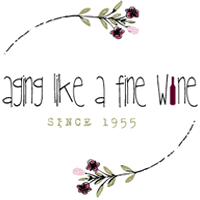 This post may contain some affiliate links. Purchasing from them help support this website at no additional cost to you. Thank you so much! 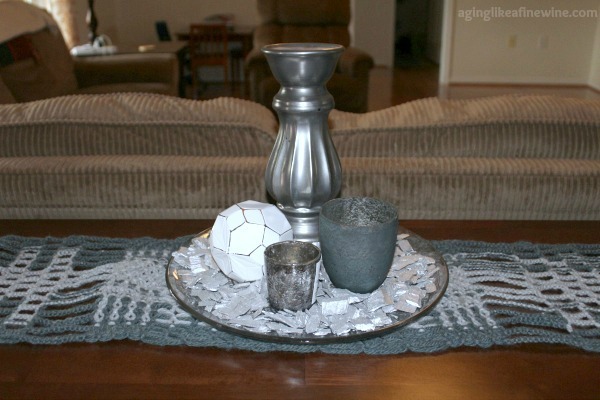 What a beautiful accent for your home! The colors you chose are subtle and elegant. Excellent craftsmanship, too. I remember when macrame was popular. I never learned how to do it, but I was a great customer – especially of of hanging baskets. Thank you Joyce. 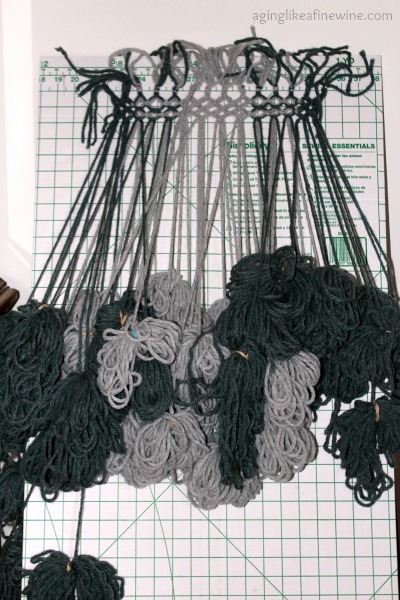 I made those macrame plant hangers way back in the 70’s, and now I am truly enjoying working with it again. Trends just kind of fade in and out don’t they! 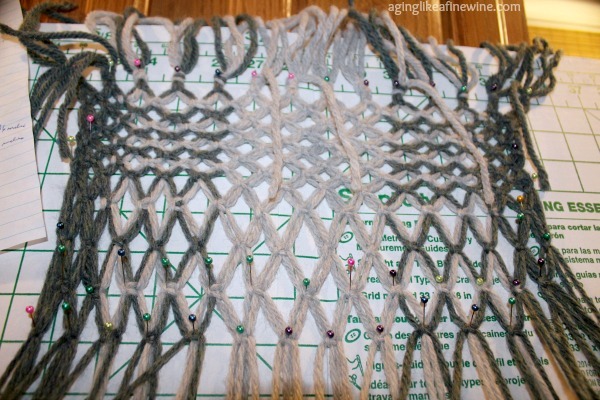 My duaghter in law asked me to make her a macrame table runner. I’m thinking I would want it to be 6 feet long. Purchased 4MM cotton cord. How much do I need? I you used 40 cords 8 yards each for 5 feet, maybe I should figure a bit more? I had quite a bit left over with mine, but I used a yarn instead of cord so the knots tie much tighter. 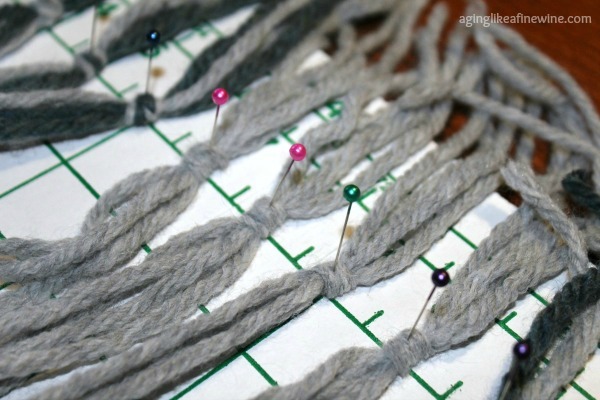 The number of knots you will be tying in your design makes a big difference too, so it’s really hard to say. That said, better to have too much than too little and not be able to complete your project. So I would go with a little more too, maybe 9 yards? Let me know how it works!